Outrageous New Orleans style barrelhouse blues, boogie, 2nd-line, swing and zydeco music. This 1st CD by Porterhouse Bob on keyboards and vocals is backed by his blazing hot horn section and special guest vocalists, Spiritual Roots. "His album contains a little of everything: barrelhouse blues, boogie-woogie, zydeco and a lot of fun. Spriritual Roots, a greaceful gospel chorus with sensual emotion, provides appropriate backing on three of Bob's original tracks. His "Po'k Chops," served up as a solo piano thrill, demonstrates Bob's adeptness at the keyboard. His love of variety rears high, as he gradually eases the tune into a grandscale Latin escapade with colorful dance floor instrumentalists on board. "Bring it to Jerome" returns to a staid, quiet, gospel adventure, then "U Ta Ta Macoomba" rools out the swamp zydeco dinnerware for supper. "BIG MOJO Records recording artist, Porterhouse Bob, has shared the stage with Jim Belushi, Charles Brown, Paul Butterfield, James Cotton, The Coasters, Willie Dixon, Floyd Dixon, The Downchild Blues Band, Charlie Musselwhite, the Persuasions, Phil Upchurch, Muddy Waters and many other renown blues artists. Porterhouse performs from behind a custom made keyboard enclosure adorned with alligators and shrunken heads. The band members rip it up with a colorful mix of barrelhouse blues, boogie-woogie, zydeco, voodoo, alligators, and tales of life in Lafayette, Louisiana. The five 'man' rhythm and horn section, featuring Mitch Montrose on drums and rubboard, Leslie Baker on acoustic bass, Mr. C.C. Burns on alto saxophone, Scotty Strathmann on trumpet and Chris Woodcock on baritone and tenor sax, provides the perfect compliment to Porterhouse's aggressive blues piano, accordian and organ licks. From tunes written by the likes of Buster Brown and Ray Charles, to original numbers, like Down in New Orleans, Biscuits N Gravy, Hot Rod Lips, Big House Boogie, and Big Fat Woman, this infectious swamp boogie serves up just fine with spicy barbecue and ice cold beer." "I have come to learn, as I'm sure you have as well, that great music means great entertainment. 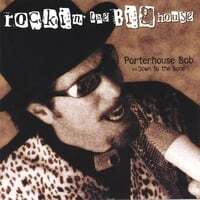 Porterhouse Bob makes great music and there is no doubt about the entertainment." "New Orleans Blues" - the words conjure up images of Louis Armstrong, Jelly Roll Morton, and King Oliver, band leaders who captivated audiences with their impassioned jazz and blues performances.All the elements that make the New Orleans sound an exhilarating experience were there - spontaneity, improvisation, mystique, and an expression of joy that seemed to belie the history of slavery, segregation, and hardship that lie at the roots of the music. French district of New Orleans and subsequent segregation laws which pushed the Creoles into the poorer American black neighborhoods.Dixieland jazz, with its obvious blues influences, was popularized in the 1920s . By the 1930s New Orleans jazz had begun its transformation into dance music and by the 1940s had evolved into bop and swing. by rollicking boogie piano, swinging horn lines and roughly hewn, spirited vocals . It was the birth of rock n' roll, rhythm and blues, funk and eventually included the artistry of such luminaries as Professor Longhair, James Booker, Fats Dominoe, Allen Toussaint, Frogman Henry, Buster Brown, and Doctor John. and influenced the rhythm section arrangements developed by club and recording musicians - ones that could afford a horn section. rocking New Orleans style blues, you CAN find this music right here in Los Angeles. Recently, I was seated in a dimly lit corner of a popular BBQ restaurant bar, waiting for a pager with flashing lights to signal my call to dinner, when I heard the sound of barrelhouse boogie piano, slapping brush drums, upright bass and wailing saxophone coming from the corner. Much like any southern roadhouse, tables and chairs had been set aside to make room for the band - there was no stage. The name of the band was emblazoned in bold lettering on the front of the hand painted piano enclosure, "Porterhouse Bob and Down to the Bone". I looked around and realized that the music was having an infectious effect on the crowd. People began smiling, offering hoots of approval and stuffing dollar bills into an alligator head, turned tip jar. One couple jumped up from their chairs and started dancing at their table. The sounds and rhythms sneak up on you, toy playfully with the left side of your brain and slowly take over voluntary control of your feet. It's a natural, earthy kind of sound. For a moment, I lost track of where I was, thinking I'd wandered off somewhere down in the old French Quarter. Standing behind a piano painted with crawfish and alligators, Porterhouse Bob, decked out in red boots, silver studded pants, a long black jacket, and a top hat adorned with a skulls, enthusiastically lead the members of his band through a variety of New Orleans - and Atlanta -style blues tunes, with a taste of Louisiana Zydeco thrown into the mix. acoustic bass, Mitch Montrose on drums and rubboard, and a jumping horn section featuring Mr. C.C. Burns, George Pandis, and Graham Dorsey. Its members hail from New York, San Francisco, and Los Angeles. the Chicago Allstars, and Paul Butterfield - mostly Chicago-style blues performers. He has written and produced music for corporate multi-media presentations, television and independent film and documentaries. you wanna get up and dance. That's what we're trying to bring to our audience. There's no disgrace in mixing the blues up with a good-time - if anyone out there thinks I haven't lived the blues because I'm laughing while I play... I got some personal stories I'd like to share with 'em." Porterhouse Bob is currently promoting the band's new CD, 'Who Called The Cops? ', released on the Big Mojo Records label. The band plays festivals and venues up and down the California coast and calls the South Bay its home. For more information on the band members and their performance schedule, please visit PorterhouseBob.com or myspace.com/porterhousebob.